Also, please, send them the link to this thread. I'm having the exact same problem. When highlighting several photos in Lightroom, right clicking and choosing edit in Aurora 2019, Aurora opens one file at a time instead of merging them all into a single file. To get it to work, I have to highlight the images and drag them onto the Aurora 2019 icon. Then, after saving the edited file, I have to synchronize the folder to import the file back into Lightroom. Please, try reinstalling Aurora. We recommend doing a full uninstall with AppCleaner. 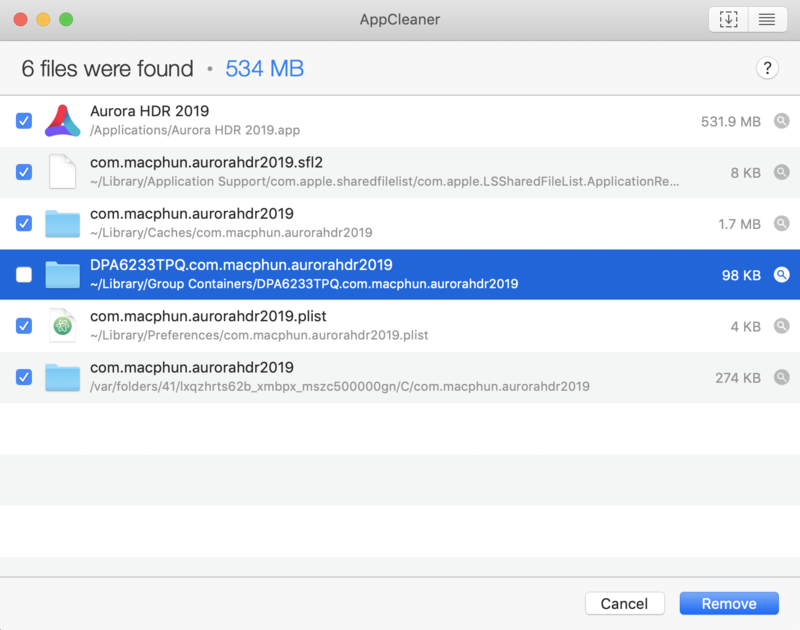 AppCleaner is a free app that automatically removes not only applications but also the related files, making 'clean' uninstall easy. I followed the directions but still have the same problem. Of the multiple bracketed photos exported from Lightroom, Aurora will only open one photo at a time to edit as a single image. Once that image is closed it will open the next image and repeat that until all of the photos have been individually opened or individually canceled. It will not combine the bracketed images into one file. @Doug Long - Could you please keep using this method while we investigating Edit In issue? I have never used EDIT IN when transferring files between Lightroom & Aurora and I don't think it should be recommended. Using EXPORT >AURORA HDR 2019 - (with or without Lightroom adjustments), works very well and returns the merged image to the Lightroom Library, automatically saved. So I'm a bit confused over why you would ever need to use EDIT IN, its an inferior way of doing things. Not sure why you would consider it Inferior, It's standard practice and have been using that method for years IE: EDIT IN Photoshop as Layers, If it's so Inferior, then why is it listed in the EDIT IN Dropdown? Using this works fine for me but its a bit of a long-winded way to do things. Using the Plug-in gives a more integrated workflow. Now I know there is both an "Edit In" and "Export to" when right clicking. Using the export command works well. Not sure why there's both, but I guess the edit in command is for a single photo. Thanks for all the help! Hi @Vaughn Dunham The EDIT IN menu option is standard function of Adobe Lightroom. By configuring this in PREFERENCES > EXTERNAL EDITORS, you can send an image to any Photo processing software. The EXPORT >AURORA HDR 2019 (or Export >Luminar 3) command is supplied by Skylum as part of their Plugin software to make the transfer and return of the images an integrated process. So when in Aurora and you go to AURORA HDR 2019 >INSTALL PLUGINS choose Adobe Lightroom, this installs the Plugin into Lightroom (which isn't there as standard). When you go back to Lightroom and choose FILE >PLUG-IN MANAGER, you should see it installed and running (see attached screenshot). The Plugin is designed to be a better way of doing things than using the Edit In command. Don't know if that explains it or not!